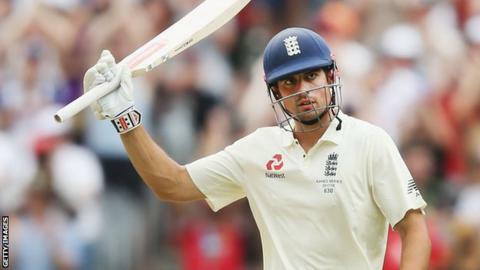 Alastair Cook made the highest score by a visiting batsman at the MCG to give England firm control of the Boxing Day Test. Cook piled on 244 not out, beating the 208 of West Indies legend Sir Viv Richards, as the tourists punished Australia on the third evening of the fourth Ashes Test. At 307-6, England were in danger of surrendering the initiative, but Cook added 59 with Chris Woakes (26), before a riotous partnership of 100 with Stuart Broad, who swung his way to 56. In the end, Cook’s third-highest Test score had led England to 491-9, a lead of 164. On an unresponsive surface, Australia missed injured pace bowler Mitchell Starc but they also created their own problems. Cook was dropped on 153 by home captain Steve Smith, the same man who offered the former England skipper a reprieve on day two. Woakes also edged between Smith and wicketkeeper Tim Paine on 13. But that is to take nothing away from England, who have put in a spirited response to surrendering the Ashes after three Tests. They have an outstanding opportunity to end an eight-match losing streak in Australia and avoid a second successive 5-0 whitewash down under. Until this point, it has been a hugely disappointing tour for England, who have not only lost the Ashes but been dogged by off-field problems. Here, though, led by Cook and Broad, they produced a performance reminiscent of their 2010-11 triumph in this country. When number 10 Broad arrived, they were only 46 ahead on a pitch that could prove difficult for the side batting last. What followed was terrific entertainment as Broad chanced his arm and Cook ticked off the milestones. The opener reached his second double century of the year, surpassed Brian Lara to become the sixth highest Test run-scorer of all time, and is line to become the first England batsman for 20 years to carry his bat through a completed innings. 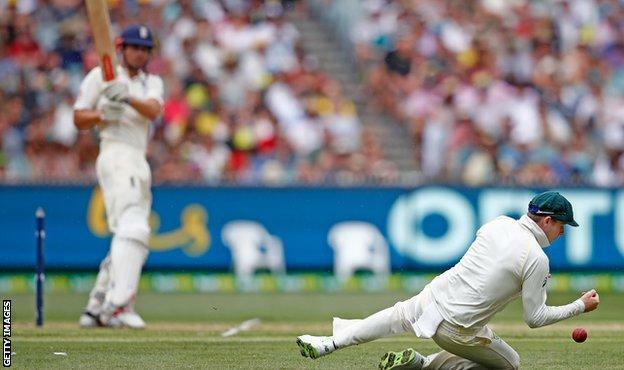 As Australia tired, Cook’s strokeplay grew in class, while Broad’s unpredictability led to increasing levels of frustration for the home side. It all provided sheer delight to the travelling England fans, who sang throughout. Starc’s replacement, Jackson Bird, has figures of 0-108 and was serenaded with the song that tortured Mitchell Johnson seven years ago. Cook arrived to play his 151st Test in Melbourne with questions over his future after managing only 83 runs in six innings in this series. In response, he ground out an epic knock – 10 and a half hours of determination, application and, at times, uncharacteristic fluency. Resuming on 104, the left-hander’s scoring continued to come mainly square of the wicket. Cuts, prods and pushes went into the off side, hooks and pulls into the leg side. Dropped on 66 by Smith on day two, Cook was given another life when he hooked Pat Cummins to square leg. Smith dived to his right, but could not cling on with a one-handed effort. Cook remained watchful and patient throughout, the tempo not changing until he made it into the 190s and danced to loft Nathan Lyon for a straight boundary. Soon after, the left-hander met Bird with the sort of straight drive that had been the occasional highlight of his 409-ball stay to bring up his fifth Test double century. Only the great Wally Hammond has more for England. From 192-2 overnight, England were in danger of wasting the opportunity to take a significant lead through rash shots and poor decisions. Joe Root got the one run he needed to complete a half-century, but horribly top-edged Cummins to deep square leg for 61. He has converted only five of his past 27 half-centuries into hundreds. 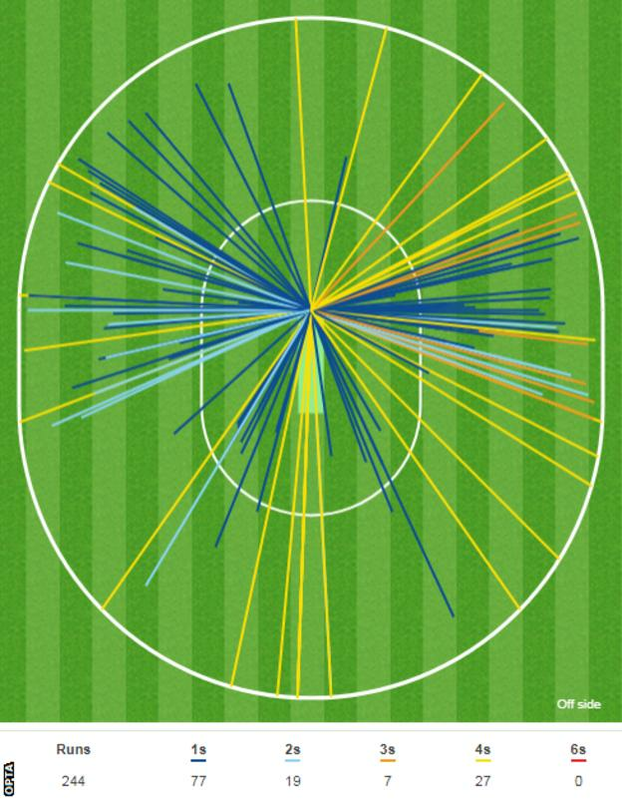 Like James Vince on Wednesday, Dawid Malan was lbw to Josh Hazlewood when a review would have saved him – there was both an inside edge and the impact was outside the line. Jonny Bairstow edged a shortish delivery from Lyon behind and the skittish Moeen Ali was dropped at long-off before being well held at short cover by Shaun Marsh off the same bowler for a 14-ball 20. England were still 20 behind when Woakes arrived, the number eight surviving a Cummins barrage to edge his way to 26. Broad was given a more torrid time, jumping and swiping as Hazlewood and Cummins dealt almost exclusively in bouncers. Somehow he survived, and was rewarded with only his second half-century in four years. Lyon was lofted for six over long-on, while deep fielders were teased with miscues, edges and the occasional middled blow. 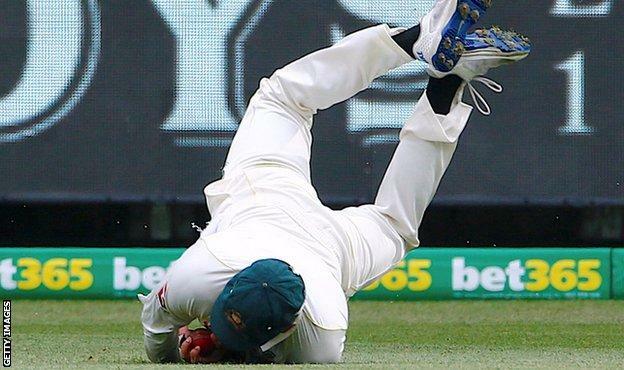 It was ended when Usman Khawaja tumbled at third man to take a catch off Cummins, a brilliant diving effort that was only confirmed to have been held by the third umpire after numerous replays. England batsman Alastair Cook: “Last night was quite an emotional 20 minutes from where I have been. Getting a hundred didn’t count for much unless I backed it up today. Australia coach Darren Lehmann on BT Sport: “Cook was fantastic, the way he concentrated for the whole day. He is an absolute superstar.